i-graphy Camera Insert is roomy for all your photography equipment. 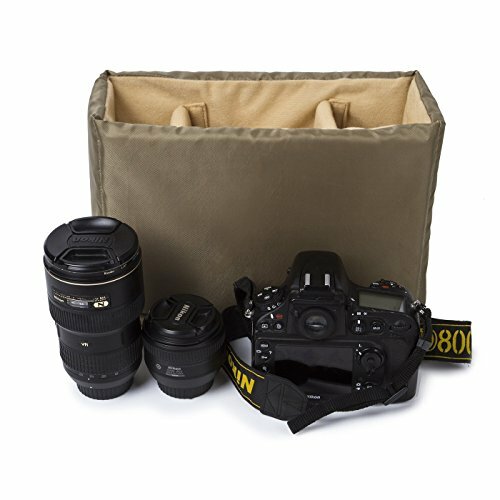 The best feature is the main compartment with its adjustable cells that will accommodate your unique group of accessories.Compatible with any bag.It is very suitable for photography lovers to use in short trips or daily travel. - 100% Brand New, you will love this insert as soon as you get it. - Made of high density nylon fabric with excellent stitching technic which makes it strong and durable. - This insert can hold up to camera, with enough room to accommodate your additional accessories. - Warranty: All of our bags have 1-YEAR WARRANTY. Any problems with your bags, please contact us. We will solve it. - Please allow little color difference due to different camera or light environment. Made of high density nylon, rain-proof, anti-wrinkle and anti-scratch.Foldable, lightweight, and portable. Well-matching a backpack or shoulder bag . Note : Insert Case ONLY ! Camera, Lens and other accessories are NOT Included . If you have any questions about this product by G-raphy, contact us by completing and submitting the form below. If you are looking for a specif part number, please include it with your message.